For more Olive Tree Ministries Resources click here: http://www.olivetreeviews.org. 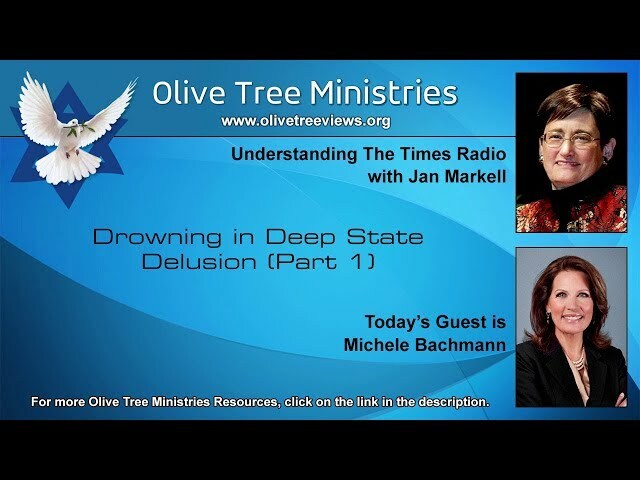 Jan’s guest for the hour is Michele Bachmann in part 1 of a 2-part series. Just what is the “deep state” and how are they promoting end-time lawlessness? How does President Trump fulfill prophecy? A multi-billionaire cabal is pushing for global government and Michele explains who they are and why. We use the mobile app found at www.oneplace.com. For more Olive Tree Ministries Resources click here: http://www.olivetreeviews.org. 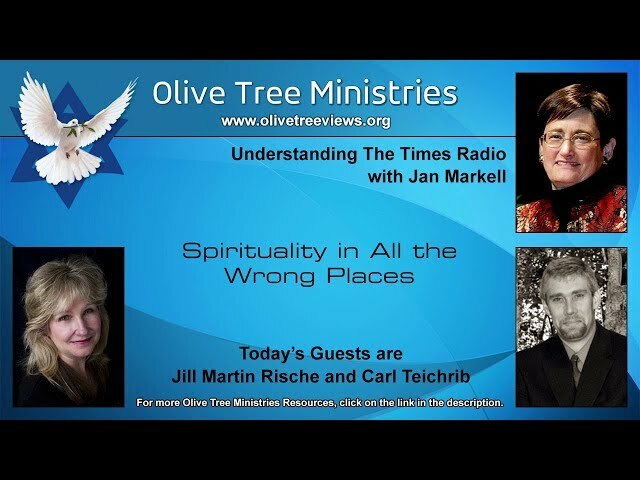 Jan Markell and her guests, Jill Martin Rische and Carl Teichrib, discuss Paganicon, Burning Man, a “Christian witch” convention, occultism in Walmart, Tom Brady’s occultic wife, and much more. Amazon Prime has a new movie celebrating the Antichrist. How much more evidence do we need that Satan knows his time is short and he is pushing back with his darkness. Jan and Carl attended a Twin Cities’ pagan festival and report. We use the mobile app found at www.oneplace.com. For more Olive Tree Ministries Resources click here: http://www.olivetreeviews.org. 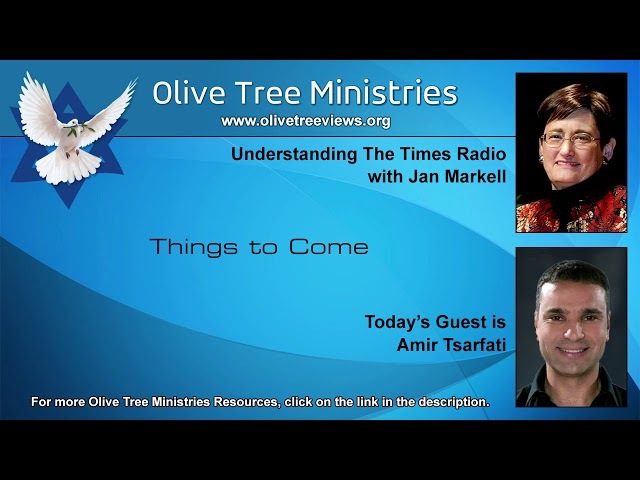 Jan Markell talks to Amir Tsarfati for the hour. When our pulpits are silent about important topics, the people remain clueless on vital issues. Jan and Amir talk eschatology, current events, and church issues. Find his book in our online store. We use the mobile app found at www.oneplace.com. For more Olive Tree Ministries Resources click here: http://www.olivetreeviews.org. 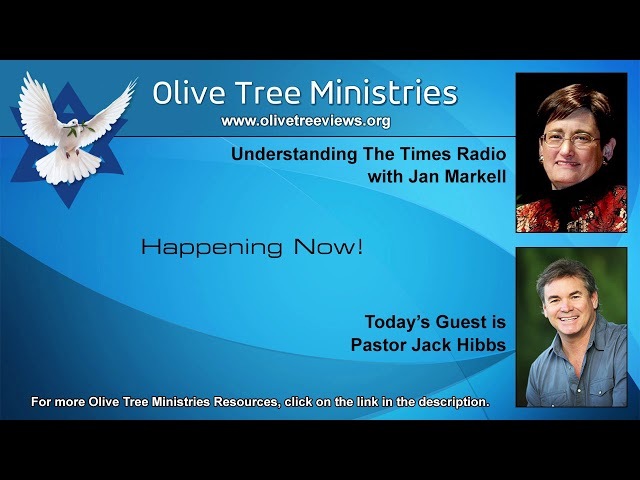 Jan Markell’s guest is Pastor Tom Hughes. 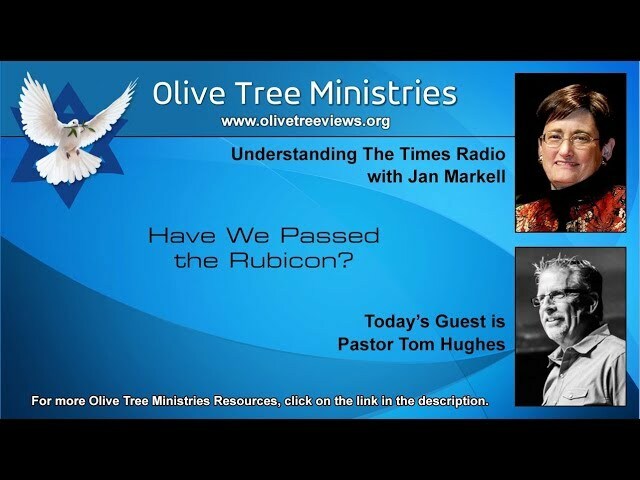 They discuss more than a dozen reasons why we are in the predicted “perilous times” of II Timothy 3 and ask the question, “Have we passed the Rubicon”? Troubling issues today are a herald of His coming. We use the mobile app found at http://www.oneplace.com. For more Olive Tree Ministries Resources click here: http://www.olivetreeviews.org. Jan Markell’s guest for the hour is Pastor J.D. Farag. The world has lost “expectancy” for the Lord’s return and one pastor calls it a distraction. Others are mocking the subject. Jan and Pastor J.D. also talk current events in light of the Bible and lateness of the hour. We live in exciting times yet very few care. We use the mobile app found at http://www.oneplace.com. For more Olive Tree Ministries Resources click here: http://www.olivetreeviews.org. 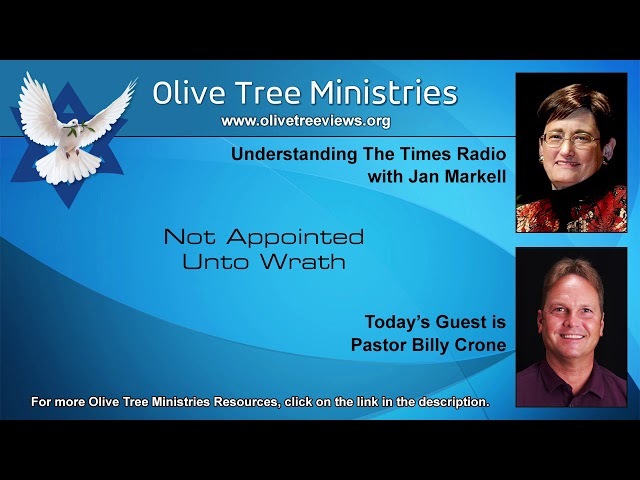 Jan Markell’s guest for the hour is Pastor Billy Crone. They talk about the Tribulation and why the Church is absent. Then they discuss the one-world religion and the role of the Vatican. Pope Francis is the world’s biggest globalist and promoter of a single faith. Could he play into things foretold in Revelation? Find Crone’s DVD set on the Seals of Revelation at https://store.olivetreeviews.org/product/the-seals-dvd-set/. We use the mobile app found at http://www.oneplace.com. For more Olive Tree Ministries Resources click here: http://www.olivetreeviews.org. This is part 2 of a discussion of music in the church that has resulted in the worship wars. Is the music in your church representing sound theology and artists, or is the music repetitive, promoting apostasy, and at a volume that is dangerous? 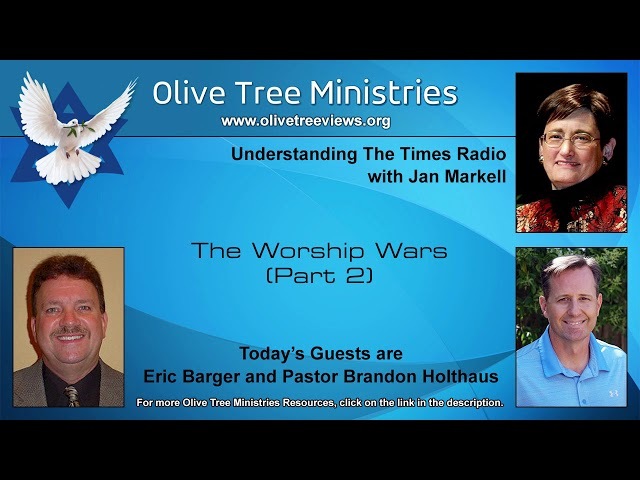 Jan Markell, Pastor Brandon Holthaus, and Eric Barger, conclude this two-part series. How sound is “Jesus Culture” and “Hillsong”? We use the mobile app found at http://www.oneplace.com. For more Olive Tree Ministries Resources click here: http://www.olivetreeviews.org. Jan Markell addresses Christian worship music, its unsound theology, and inappropriate words. She and her guests, Eric Barger and Pastor Brandon Holthaus, ask why most every church uses Hillsong and Jesus Culture music when they may represent unsound ministries? Is this just more of the end-time apostasy predicted? God’s love is not reckless, yet that is one of today’s most popular songs and represents the heart of the worship wars. This is part one of a two-part series. We use the mobile app found at http://www.oneplace.com. For more Olive Tree Ministries Resources click here: http://www.olivetreeviews.org. Jan plays Amir Tsarfati’s conference message from last fall. Amir talks about a number of issues that will play out in the very last days. The church may be absent from much of it. What happens to Islam when they are defeated in end-time wars? Why are there two Gog-Magog wars? Enjoy how Amir connects the last days’ dots and puts the puzzle pieces together! We still offer complete sets of conference DVDs in our store. We use the mobile app found at http://www.oneplace.com. For more Olive Tree Ministries Resources click here: http://www.olivetreeviews.org. Jan Markell and Pastor Jack Hibbs conduct a “Happening Now” at his church in Chino Hills, California, a few weeks ago. They discuss current events and Bible prophecy and take some audience questions. We use the mobile app found at http://www.oneplace.com. For more Olive Tree Ministries Resources click here: http://www.olivetreeviews.org. Jan Markell discusses the perils of the paranormal with Eric Barger and Jill Martin Rische. We are watching evil wax worse and worse as predicted for the last days. From the demon possession and blatant occult featured on Netflix to the Arch of Palmyra in Washington, mankind is celebrating the dark. This has consequences. What can Christians do? Listen to Steven’s warnings. We use the mobile app found at http://www.oneplace.com. For more Olive Tree Ministries Resources click here: http://www.olivetreeviews.org. 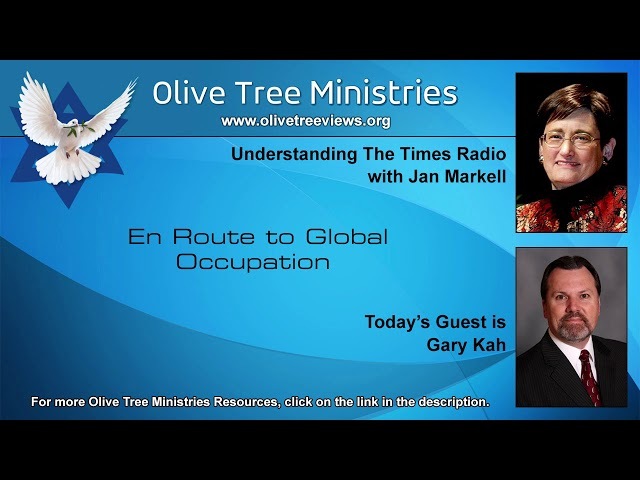 Jan Markell spends the hour with Gary Kah who has been monitoring the “New World Order” for 30 years. This will be Antichrist’s kingdom outlined in the Bible. Who are the major players and how soon might their agenda appear? If it is on the horizon, how late is the hour? We use the mobile app found at http://www.oneplace.com.